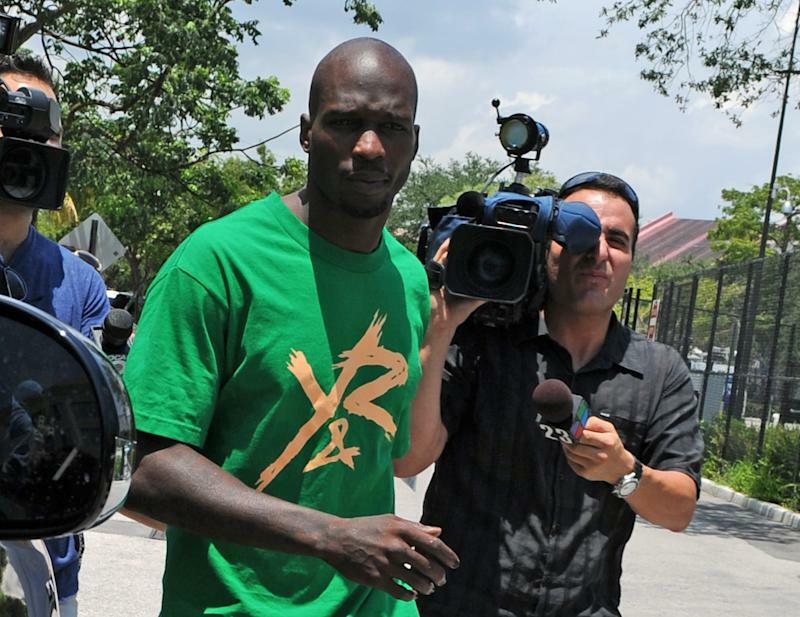 FORT LAUDERDALE, Fla. (AP) — Former NFL star Chad Johnson was sentenced Monday to 30 days in jail for a probation violation in a domestic violence case by a judge who angrily rejected a no-jail plea deal after Johnson playfully slapped his attorney on the backside in court. It was all set until Johnson, when asked by McHugh if he was satisfied with his lawyer Adam Swickle, gave the attorney a light swat on the rear — as football players routinely do to each other on the field. The courtroom erupted in laughter and at that McHugh said she wouldn't accept the deal. "I don't know that you're taking this whole thing seriously. I just saw you slap your attorney on the backside. Is there something funny about this?" McHugh said, slapping the plea deal document down on her desk. "The whole courtroom was laughing. I'm not going to accept these plea negotiations. This isn't a joke." Johnson, 35, tried to apologize and insisted he meant no disrespect. Johnson was on probation after pleading no contest to head-butting his then-wife, TV reality star Evelyn Lozada, during an altercation last August. She quickly filed for divorce after barely a month of marriage and Johnson, a six-time Pro Bowl wide receiver, was immediately released by the Miami Dolphins. He didn't play at all last season. "This is your courtroom. I have no intent to make this a joke. It's not funny," Johnson told the judge "My life is in a shambles right now and I try my best to laugh and keep a smile on my face." But McHugh, who could have given Johnson up to a year in jail, was not moved. "It's not the first time he's behaved that way in my courtroom," she said. Johnson then was handcuffed and hauled away to jail. Swickle declined comment on whether he would seek a reduced sentence. Johnson has been undergoing therapy aimed at helping people involved in domestic violence but has not signed with another NFL team. He said in court Monday he hoped that would change in the upcoming football season, but now faces another setback. "He has suffered. He has lost everything," Swickle told the judge. Johnson, whose best playing days were with the Cincinnati Bengals, caught 766 passes for more than 11,000 yards and 67 touchdowns during his career. He also played for the New England Patriots. Lozada stars on VH-1's"Basketball Wives" TV show. She was previously engaged to ex-NBA star Antoine Walker, who played for the Miami Heat, Boston Celtics and other teams, and was a star on the University of Kentucky's 1996 national championship team.